This appears in the Friday, July 1, 2011 edition of the Business Mirror. The Philippine Men’s Football National Team is talented no doubt, but chemistry is always integral to a team’s success. Since the arrival of the Fil-foreigners in 2004, the problem is many of them arrive days before the match. That means missing valuable time at training camp and to know the tendencies of teammates. Given now that there are many first-timers on the team that becomes a bigger problem. Speaking of first-timers, yesterday was the first cap where Angel Guirado and Phil Younghusband played up front together. They connected well on one occasion where one touch passing led to a very good chance by Phil to score except it went straight to Manjula Fernando. Now consider that. Recognition. If they play longer and if Guirado -- I could be wrong here – is a little more match fit, that’s a great combo up front. What does this mean for Ian Araneta? I figure Ian will start once in a while if not come off the bench. He’s too talented to be left off. He does know how to get into scoring position. It’s the finishing that bugs him and he knows that all too well. And that is why he is on the bench. Good account for Nate Burkey in his Azkals debut. The former Virginia Commonwealth University Ram, played out of position (he’s a midfielder) – in a questionable move because it seemed logical to see Araneta come in for the hobbled Phil. But it worked didn’t it? Just the same when Michael Weiss lifted Anton del Rosario for Jason Sabio in the Mongolia-Panaad match late in the second half in a move that paid dividends when the latter assisted Phil for a goal. And in the away game in Mongolia and the AFC Challenge Cup Qualifiers in Myanmar, Yanti Bersales, criticized as too old for the team, came off the bench to provide some aggression in the forward position. He nearly scored too on a couple of occasions. 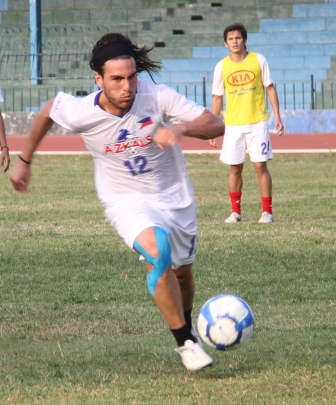 While some moves may have not worked, I figure that Weiss is still fine-tuning the Azkals’ gears. He still has done a good job. Once more speaking of playing out of position, Fil-Dutchman Paul Mulders, a natural attacking mid, played at left back in his Azkals’ debut. Without Ray Jonsson and Roel Gener, he had to play the spot. Now that reminds me of Liverpool’s Glen Johnson playing in the left back slot without Fabio Aurelio and he struggled. Maybe that contributed to the shakiness of the defense. But there’s room for growth. The coaches were raving about his talent and maybe a return to his more natural position is best. But Stephan Schrock occupied that position yesterday. The midfield at times looked chaotic but for the first time since Chris Greatwich played the middle during last year’s Suzuki Cup, we had someone who could bring that ball up field in Schrock. He had a couple of nice runs where he slalomed through defenders. Connecting with the attacking third is now something he has to work on. Think about playing out of position and how big a deal it is. Looking back at recent history, Jonsson was moved up to the midfield where has not played in a while. In practice sessions it worked but against Mongolia it did not. The link up between the midfield is important because it sets up a proper attack and the long ball play they showed in the first half got them nowhere. Once they settled down, Schrock, Caligdong, James Younghusband, and Manny Ott were able to step up the pressure. However, it Ott was playing holding midfield yesterday, I am not sure that worked too well. What can you say about James Younghusband? Behind that floppy Harry Potter mane is a tough competitor. He was fighting for the ball and with the Sri Lankans. Although he dispossessed a Brave Reds defender of the ball in scoring position (the opportunity never materialized though), I miss those crosses of his. And I like his ferocity. I think he was just as responsible for that goal by Nate Burkey (as was Chieffy Caligdong). Much has been made about Neil Etheridge’s goaltending in recent games (including the friendlies). You get the feeling that there’s a lot on his mind. I have not been able to see this team really up close since Panaad so I cannot comment about his confidence. Some like to point to Etheridge’s youth as a cause for recklessness. Maybe so. But I think that is really his style of play – rushing out and straying from his line. However, that save in the 90th minute from a heater by Nimal was brilliant. The defense had their backs turned on that play and the Fulham reserve keeper came away with a game saver. Yesterday, while making an appearance on ANC for game analysis, host Boyet Sison asked me about the team brimming with confidence – was it good or was it misplaced. I answered that it was good because unlike before, they headed into a match knowing they had no chance. Now they have talented players on the squad. The quality of players is so much better. It is more of a chemistry concern than anything. The team knows they have good players and that better training, better support, and a massive following pushes them. I’d rather have that any day than the old days when we used to be on the business end of maulings. If I were the coach back then I would have filed a police complaint for assault. But now? We’re not an easy foil for anyone. Whenever you play an away game, the best result that you can hope for is obviously a win. But if you can walk away with a draw and you’re going back home, that’s a good feeling. Now whether it’s Rizal Memorial Football Stadium in Manila or Panaad Stadium in Bacolod, we better have one home field so they get used to the field, the conditions, and the atmosphere. Home field advantage isn’t just the field but also home. Home is where you go home and can settle into your regular routine. It might sound ridiculous but for athletes, focus is also a product of comfort. And the game demands 90 minutes of focus. You saw that we almost got nailed in the game’s dying minutes. Too many teams know that. Even the great ones. Bayern Munich rues that Champions League loss to Manchester United. Ditto with Germany during the 2006 World Cup when Italy piped them. We’ve also dealt that kind of heartbreak too. Most recently against Singapore. Onto the friendly confines of that good ole home cooking. I'm not going to harp about the pitch. They all played on the same surface. In a New York Groove (a nod to Ace Frehley) with the New York Knicks Dancers who arrived last night. They'll be appearing at the NBA 3-on-3 event at MOA. Snapped at one of the dressing rooms at ABS CBN during our guesting on Hardball last night. This appears in the Thursday June 30, 2011 edition of the Business Mirror. COLOMBO, SRI LANKA -- The Philippines’ debut in World Cup play ended in a 1-1 draw with host team Sri Lanka at the Sugathadasa Stadium. Nate Burkey, a late first half substitute for a hobbled Phil Younghusband, headed in a free kick by Emelio “Chieffy” Caligdong in the 50th minute that gave life to an embattled Philippine side. The Brave Reds struck first when midfielder Chathura Gunaratne scored off a powerful free kick from some 25 yards out that was deflected by central back Rob Gier into the Azkals’ goal. The Azkals struggled early in a testy first half as both squads played physical. But after an altercation in 18th minute that saw midfielders Stephan Schrock and James Younghusband carded by Bangladeshi referee Shamsurraman Hassan after the former fouled Fazul Rahuman, the Philippines ironically gained control of the match. That is until Chathura’s stunning strike that nearly deflated the Philippine team. But instead of folding, the Philippines came out after the lemon break with renewed intensity. Following Burkey’s goal, the Azkals saw several more chances including runs by Caligdong and a volley by Ian Araneta, who came in for Burkey, that was stopped by Sri Lankan goalkeeper Manjula Fernando who played brilliantly all match long. Fernando, who minds the net for Blue Star SC in Sri Lanka, stopped three scoring chances by Younghusband. But the Azkals’ very own Neil Etheridge was also up to the task at goal. In the 90th minute, Nimal caught the Azkals’ defense napping as he blasted a shot from just outside the box that the Filipino keeper successfully parried away. The final outcome wasn’t what the Philippine team was expecting but the Nationals will have a chance to advance when they host Sri Lanka on July 3 at the Rizal Memorial Football Stadium. In order for the Azkals to move on to play Kuwait, they have to win or hold the Brave Reds to a scoreless draw. Notes: Three Azkals were given cautions: Stephan Schrock, James Younghusband, and Aly Borromeo. Fil-Dutch Paul Mulders started in place of regular left back Ray Jonsson who was unable to join the Azkals in Sri Lanka. This appears in the Thursday, June 30, 2011 edition of the Business Mirror. When the Philippine Men’s Football National Team played Mongolia during the AFC Challenge Cup Qualifiers at Panaad, Bacolod last February, the stadium was packed with some 16,000 plus people who cheered and gasped with every move made by the Azkals. As terrific as the support the Azkals got, the cheers and chants died down quickly as the crowd couldn’t muster anything sustainable. Joson gained a measure of infamy when he ran down the track of Panaad Stadium prior the start of the Philippines-Mongolia match while dressed up in a blue wig and face paint. “That day the Blue Haired Freak was born,” joked Joson who is now known by the moniker. While talking to Philippine Football Federation Treasurer Bonnie Ladrido while watching the replay of the Azkals’ games in the recently concluded AFC Challenge Cup Qualifiers in Myanmar, the two thought of organizing a booster group that would help come up with cheers and chants for succeeding football matches. Joson saw the local football film Happyland where there was a feature of street music as done by musician Paul Zialcita. Instead of using traditional percussion instruments, Zialcita used water jugs; the type used for water coolers. Along with Joson and many other football fans who are now called “Kaholeros”, they have come up with beats and chants (inspired by native beats) that they first unveiled during the recent exhibition match between the United Football League All-Stars and the Azkals (that ended in a 4-3 win by the former). Got the Kaholeros up real early. Call time at Rizal Memorial Football Stadium was 430am for a live feature on Sapul sa Singko on TV5. I arrived late coz my migraine was killing me. The appeared on three segments on the show to talk about the origins of the Kaholeros as well as teach Pinoys everywhere the drumbeats and the simple chants and cheers that they will unveil in full force on July 3. They gave the public a taste of it during the UFL All-Stars-Azkals exhibition match. Richard "Ebong" Joson is the head of the Fan Committee of the Philippine Football Federation and this began after an off-shoot of his Blue-Haired Freak debut at Panaad (during the Mongolia game). While watching a replay of the Philippines-Bangladesh match at National Sports Grill, Joson was approached by PFF Treasurer Bonnie Ladrido and that's where the ball got rolling. Together with percussionist Paul Zialcita (and the suggestions of many others), they got the Kaholeros going. Paul Zialcita discovered the aquadrums at a water cooler while at work. As a percussionist, he likes to tap things to discover their sound. When he first tapped the aquacooler, it changed his life and it's a love been nothing but a love affair with the music that an aquadrum creates ever since. What every well-dressed Kaholero will be wearing at the match on July 3. I guested with the Kaholeros in their last segment on Sapul today. Had a blast. And it helped get my mind off the migraine. 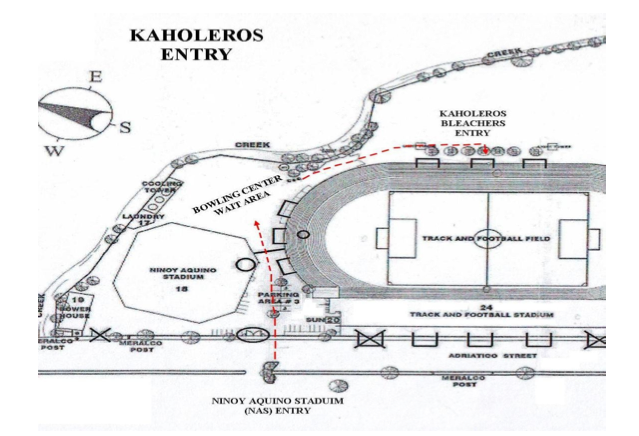 And below, check out the guide where the Kaholeros will enter for the July 3 match. This appears in the Wednesday, June 29, 2011 edition of the Business Mirror. In their entire footballing lives, neither team has participated in a World Cup Qualifiers. Either the teams did not enter, withdrew their participation of were denied a chance to qualify for the world’s biggest and most prestigious tournament. The Brave Reds, as the Sri Lankan booters are nicknamed and ranked #169 in the world by FIFA, are coming off a dismal AFC Challenge Cup Qualifiers where they draw one match and handily lost two others. The Azkals, as the Filipinos who are ranked #155 by FIFA are called, qualified for the next stage of the AFC Challenge Cup as they finished runners-up in their Group with a 1-win (a 3-0 thrashing of Sri Lanka’s South Asian neighbor Bangladesh) and a pair of draws (1-1 against nemesis Myanmar and 0-0 against group winner Palestine). The Sri Lankans haven’t been idle as they have trained in the Korea under former South Korean internationalist Jang Jung who aside from playing in his homeland for Lucky Goldstar Hwangso also played in the domestic leagues of Malaysia (Perak FA and Singapore M-League Team) and Singapore (Geylang United). Jung has been coaching in Sri Lanka since 2006, first with the U-23 national squad and in 2008, with the senior team. Jung admitted to the Sri Lanka Daily Star that the team was only formed a few weeks ago due to delayed selection process. Three players were banned by FIFA for their role in a match-fixing incident. However, this is a Philippine side that is unlike no other formed in its history. Bolstered by Filipinos of foreign heritage, the Azkals have turned not only the Philippines into a football-mad country but have put their regional rivals on notice. The projected starting eleven by national head coach Michael Weiss will feature the back four of Anton del Rosario, Rob Gier, Aly Borromeo, and Ray Jonsson; a midfield featuring James Younghusband, Stephan Schrock, who drew raves for his sterling playing during training camp, the vastly improved Manuel Ott, and Emelio “Chieffy” Caligdong; and at the forward position is the twin strike force of Phil Younghusband and Angel Guirado who was a revelation during the AFC Challenge Cup in Myanmar. Also included in the Azkals’ lineup are Eduard Sacapaño, Jason Sabio, Dennis Cagara, Roel Gener, Nestor Margarse Jr., Paul Mulders, Ricardo Becite, Jerry Lucena, James Rochlitz, Nate Burkey, Ian Araneta, and Misagh Bahadoran. The Azkals’ home match against Sri Lanka will be on Sunday, July 3, at the Rizal Memorial Football Stadium at 630pm (Manila time). If Ray Jonsson doesn't arrive in time for the match, look for Paul Mulders to take his place as Roel Gener is injured. For those watching the Sri-Lanka-Philippines July 3 match at the Rizal Memorial Football Stadium, kindly take note of the seat plan as well as the entrances and exits. Please be reminded that ABSOLUTELY NO DSLR CAMERAS OR VIDEO CAMERAS will be admitted. There will be no depository area for cameras or bags so you've been warned by FIFA (they're strict believe me). And NO backpacks or even umbrellas. 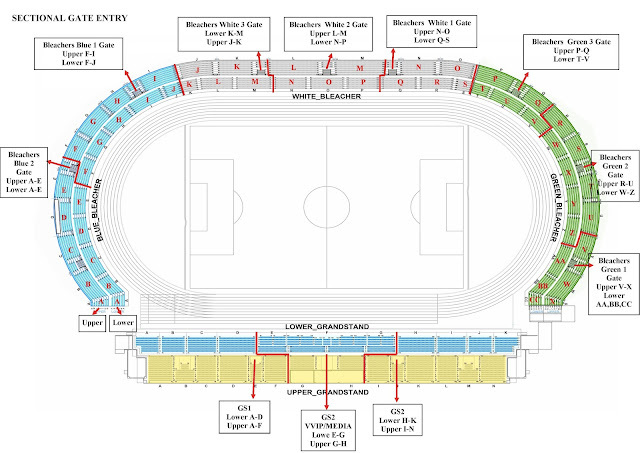 There will be food stalls inside the stadium so don't bring any inside. If the weather isn't agreeable, raincoats are permitted but not umbrellas. Save yourselves the trouble. It's a football match. Soccer Mania is a football-themed event, which will be held from July 1 to 3, 2011. This is pre-event is to to hype up the Game for the FIFA Qualifying Match between the Azkals and Sri Lanka Team on July 3, 2011. This event will be held at M. Adriatico Street, Malate, Manila, in front of the Rizal Memorial Sports Complex. Soccer Mania will involve a series of free football clinics for kids 12 years old and above. Here, we will be commissioning the help of the Futkaleros, an organization that promotes the game of “Futkal,” which is short for “Football sa Kalye.” They will serve as the coaches in the football clinics. To join the clinics, all the participants need to do is sign their names at the registration table. Registration is absolutely FREE. The clinics will be held from 2:00pm to 4:00pm on July 1-2; and from 8:00am to 10:00am on July 3. Members of Smart-Gilas Pilipinas, welcomed upon their return from Jakarta, Indonesia Monday by Samahang Basketbol ng Pilipinas Executive Director Sonny Barrios (center), flash wide smiles and the No. 1 sign after sweeping the SEABA Championship and making it to the 2011 FIBA Asia Olympic qualifying tournament in Wuhan, China in September. The long wait is over. Mizuno Azkals kits will FINALLY be on sale! 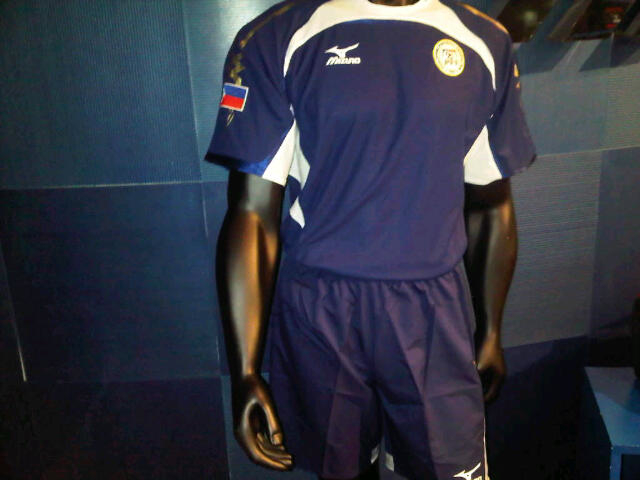 Amidst production delays and what not, the Mizuno Azkals kit will finally be available this Wednesday at Mizuno stores. This is what our lads will be wearing when they face Sri Lanka this Wednesday at Colombo. The jersey will cost somewhere around 2K. Not bad, I say! Go get some, Azkaleros. The league has yet to commence its sporting tournaments and the ten teams that comprise the NCAA are in a state of frenzy while on the path towards athletic greatness. The host school, University of Perpetual Help System Dalta, scored a knockout when they announced that no less than the world’s pound-for-pound boxing king Manny Pacquiao will be the guest of honor when the 87th Season of the country’s oldest collegiate league unfolds on Saturday, July 2, 2011 at the Araneta Coliseum. But UPHSD was also floored when Tamayo announced that men’s basketball team head coach Boris Aldeguer resigned from his post on the morning of the NCAA press conference at the ABS CBN Eugenio Lopez Jr. Building in South Triangle, Quezon City. Aldeguer who allegedly stepped down in disgust last Friday after the NCAA Mancom disallowed Paul Nuilan from suiting up for the Altas for this season. This was the second straight year that Perpetual Help was dealt a stinging setback literally days prior to the start of the competition. Last year, Nuilan and forward-center Marlon Gomez were declared ineligible by the NCAA for not submitting their proper transfer and residency papers after moving from Letran and Philippine Christian University respectively. Aldeguer hoped that the two would have served out their proper residency after being disallowed from playing in Season 86. However, the NCAA previously banned Nuilan and Gomez. Jimwell Gican, Aldeguer’s assistant and the head coach of the Junior Altas was named as Aldeguer’s replacement. It isn’t only Perpetual Help that will enter the season missing a vital cog, San Beda College, the defending champion who made NCAA history last year by sweeping the tournament 18-0, will most likely be without American center Sudan Daniel who tore his anterior cruciate ligament in the Filoil Flying V Premier Cup. San Beda’s misfortune may be Mapua’s gain. With a veteran cast and Yousef Taha who was recently named a member of the Mythical Five and Defensive Player of the Filoil Flying V Premier Cup in harness, Cardinals coach Chito Victolero believes that despite the graduation of Macky Acosta, TG Guillermo, and Erwin Cornejo, they can still compete. The Cardinals made the quarterfinals of the Filoil tourney and the finals of the Fr. Martin Cup where they lost out to National University. “Taha and Mike Parala will give us a presence inside,” said the former Cardinal who played on their last title team with Benny Cheng in 1991 with Joel Banal as their head coach. Banal’s son, Gabriel, who last played with La Salle in the UAAP, is now serving out his residency and will suit up for Mapua the following year. The Stags are without point guard Pamboy Raymundo and center Gilbert Bulawan who finished out their playing years. The traditional opening ceremony will be held at 1:00pm at the Araneta Coliseum. This is the third time that Perpetual Help will be hosting the NCAA. They previously hosted in 1995 and 2004. Perpetual Help was touted to challenge for a Final Four slot this season but without Nuilan, the Altas are left with only one big man in Gomez. “Laban lang,” succinctly said Gican. One of my prized possessions back in the early 1990s was a baseball card of Bernie Williams. It was his rookie baseball card (I still have it). It was inside that pack of Topps Baseball Cards that I bought in Shoppesville, Greenhills. It was difficult following the Yankees in the 1980's because they would play well but never get to the playoffs. That changed in the 90s when players like Williams came up from the farm system and free agents like Wade Boggs and Paul O'Niell arrived. I'd say that Gene Michaels and Buck Showalter put them on the right path too (as the Boss was unable to meddle since he was banned from baseball). 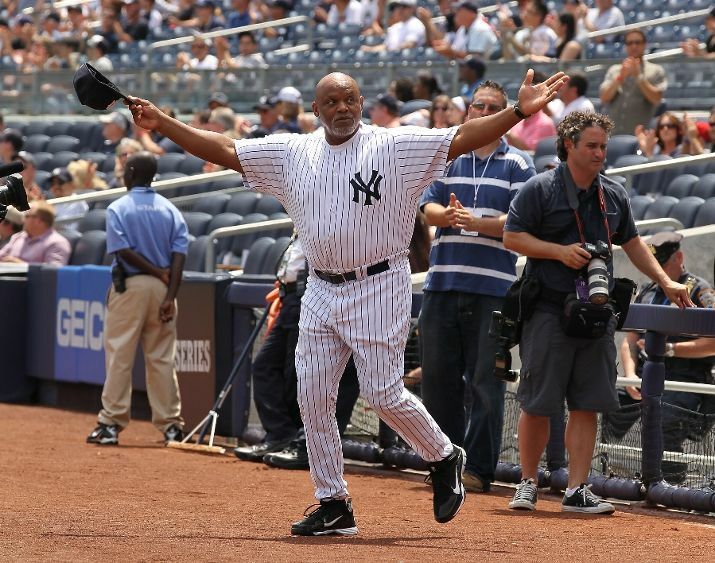 And Williams played CF, that's primo real estate in Yankee Stadium. 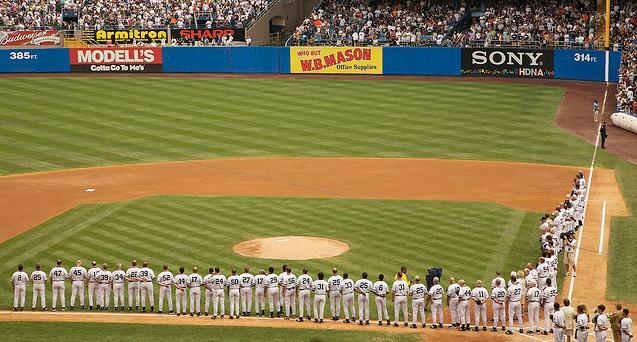 It is the hallowed ground where named like DiMaggio and Mantle once patrolled with aplomb. It was tough seeing Bernie not come back for 2007. I guess that's the cruel part of sports, that when one's skills erode, they're either retireable or tradeable. Old-Timer's Day for me, was something I looked forward to year after year. 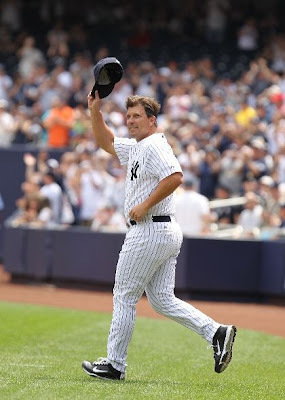 Aside from the stadium itself and Monument Park, it was a connection to the Yankees' rich and glorious past. I never saw Ron Guidry play in his prime (except on television). Ditto with Lou Piniella so Old-Timer's Day was that opportunity. Of course, the bat speed isn't there. As are the motors they call arms for guys like David Cone and even Dave Righetti but it's one game that whoever gets a hit or an out, everyone cheers. It's a day when today's generation learn about the past. And what a past! 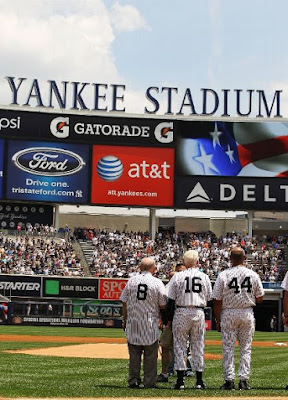 Here are the players and former members of the organization who took part in the 65th Old-Timer's Day on June 26, 2011 at Yankee Stadium (coincidentally Derek Jeter's 37th birthday). 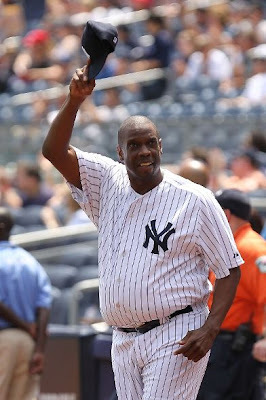 The list includes the widows of late players Arlene Howard (widow of Elston Howard), Helen Hunter (widow of Jim "Catfish" Hunter), Jill Martin (widow of Billy Martin), Diana Munson (widow of Thurman Munson) and Kay Murcer (widow of Bobby Murcer). Yankees for Old-timer's Day: Luis Arroyo, Jesse Barfield, Clay Bellinger, the eternal and ageless Yogi Berra, Ron Blomberg, Brian Boehringer, Dr. Bobby Brown, Homer Bush, Jose Cardenal, Rick Cerone, Jerry Coleman, David Cone, Al Downing, Brian Doyle, Cecil Fielder, Whitey Ford, George Frazier, Oscar Gamble, Joe Girardi, Dwight Gooden, Rich "Goose" Gossage, Ron Guidry, Charlie Hayes, Arlene Howrad, Helen Hunter, Reggie Jackson, Pat Kelly, Don Larsen, Graeme Lloyd, Hector Lopez, Kevin Maas, Jill Martin, Lee Mazzilli, Ramiro Mendoza, Gene "Stick" Michale, Diana Munson, Kay Murcer, Jeff Nelson, Graig Nettles, Joe Pepitone, Lou Piniella, Mickey Rivers, Charlie Silvera, Bill "Moose" Skowron, Aaron Small, Mike Stanley, Mel Stottlemyre, Darryl Strawberry, Joe Torre, David Wells, Roy White, and Bernie Williams. Get the popcorn, the nachos, and hotdogs. Wash them down with sodas or a beer. It's a blast from the past on a beautiful day. The photos are by Al Bello/Getty Images. How about that? 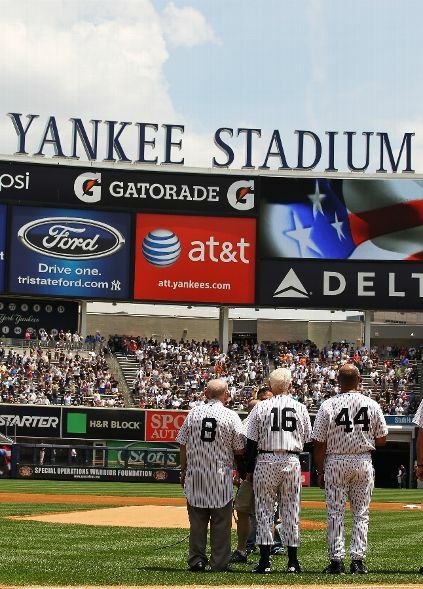 Yogi Berra (8), Whitey Ford (16) and Regge Jackson (44) standing for Star Spangled Banner at Old-Timer's Day. David Wells and David Cone. Two guys who tossed no-hitters for New York. Liverpool is thataway, Gael Clichy. It's a four-hour drive from London to Liverpool and that's a whole lot closer to Rome, Italy. That is if Arsenal left back Gael Clichy signs up with Liverpool FC (the preferred destination of this French defender) rather than AC Roma. I'd say he'd be a terrific addition to the backline of Jamie Carragher, Martin Skrtel, and Glen Johnson who played out of position for much of last season. That helps because Fabio Aurelio has struggled with all his injuries. Got a good feeling about an Anfield revival. There's a lot of positive stuff since the arrival of John Henry and the return of Kenny Dalglish. I wondered about how odd it must be for the new team owner that the Mancs are chanting "19-18" with regards to English titles. 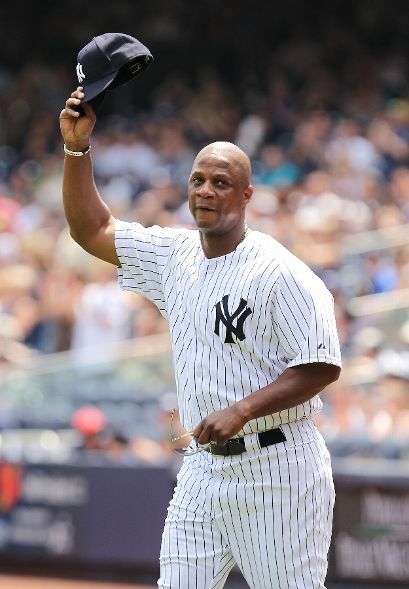 It wasn't too long ago that us New York Yankees chanted the same thing about Henry's Boston Red Sox as they last title was in 1918. Now these guys are for real. If new management is able to build a championship team in Liverpool how big a feather in the cap of John Henry will that be? I wouldn't mind that but the Bosox can go to where the sun doesn't shine. JAKARTA -- Smart Gilas Pilipinas overwhelmed Singapore, 106-51, to complete a three-game sweep of the elimination and officially clinch a title match with the winner of the game between Indonesia and Malaysia, which was being played at press time. Nine players struck in double figures with Mark Barroca and Japeth Aguilar scoring 18 points each. The top three teams in the SEABA meet will qualify to the FIBA Asia Olympic qualifying tournament in Wuhan, China in September. Smart Gilas Pilipinas 106 – Barroca 18, Aguilar 18, Baracael 17, Ababou 14, Tiu 11, Lutz 11, Douthit 8, Casio 5, Ballesteros 4. Quarterscores: 30-9; 60-23; 77-43; 106-51. JAKARTA – Chris Lutz scored 20 points and Japeth Aguilar added 19 as Smart Gilas Pilipinas coasted to an easy 94-54 victory over Indonesia in the 9th Southeast Asian Basketball Association Championship at the BritAma Arena here. The Nationals sent the hosts in foul trouble early, seizing a 20-9 lead built on 12 free throws and Marcus Douthit's incursions before exploiting the open court for a 27-point halftime bubble that never got threatened the rest of the way. “We stopped their penetrations while attacking the basket aggressively on the other end,'' said Smart Gilas coach Rajko Toroman. With the win, the Filipinos, who downed the Malaysians on Thursday, are guaranteed of a seat in the Fiba Asia Championship in Wuhan, China on Sept. 15-25, the qualifier for the 2012 London Olympics. Malaysia and Indonesia, which split their first two matches, are hoping to book the two other available tickets to Wuhan in this four-nation meet. But a Philippine victory over Singapore (0-2) at the end of the elimination round still being played at presstime will assure Malaysia and Indonesia of representing the region in the Asian championship along with Smart Gilas. “We struggled and had a slow start the other night because we lacked practice time. Today, we played a great game,'' said Toroman. Smart Gilas went 30 of 54 (56 percent) from the field, converted 30 of 42 freethrows and moved the ball exceptionally well with 17 assists. The only flaw in the Filipinos' performance was the 26 offensive rebounds they allowed as the Indons crashed the boards, 40-38, despite the mismatch in height. Nevertheless, Aguilar put on a show that endeared him to a clique of Filipino fans behind the Smart Gilas bench and the Indonesian crowd as well. The 6-foot-9 Aguilar dunked the ball with flair five times, including two alley-oop throwdowns in traffic to the delight of the entire arena. “They have the homecourt advantage so we can't take them for granted. We just focused on stuff that we have to do,'' said Aguilar. Douthit scored seven of his 11 points in the opening quarter, Dylan Ababou had 13 points and accounted for five of the team's nine steals while JV Casio added eight points and seven assists. Smart Gilas made it 71-38 after the third and erected the largest lead of the night, 94-48, on a Mac Baracael feed to a soaring Aguilar for another rim-rattler that netted a three-point play. 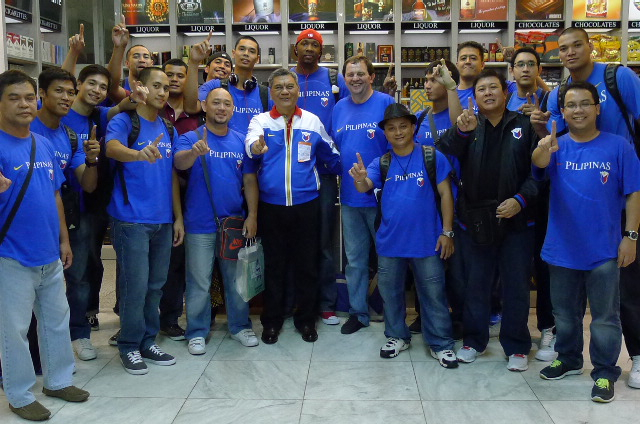 SMART GILAS PILIPINAS 94 – Lutz 20, Aguilar 19, Ababou 13, Douthit 11, Casio 8, Baracael 7, Barroca 6, Tiu 6, Ballesteros 4. INDONESIA 54 – Poedjakesuma 10, Prawiro 8, Thoyib 8, Indrawan 6, Prihantono 5, Wuysang 5, Situmorang 4, Aryo 2, Ahmad 2, Gunawan 2, Setepu 2, Chandra 0. In a UAAP Board meeting last February 14, 2011, the subject of Aldrech Ramos and Greg Slaughter playing for Smart Gilas in the PBA Commissioner’s Cup was brought up. Bro. Bernie Oca of DLSU read the letter from the Samahang Basketbol ng Pilipinas requesting that the two players be allowed to play with Gilas. Dr. Lani Gonzalo of UP pointed out that Slaughter wasn’t a UAAP player. The Ateneo officials, Richard Palou and Emmanuel Fernandez said that Slaughter was enrolled and was in his residency year. Furthermore, he will suit up with the Blue Eagles for Season 74. Palou said in the case of Slaughter, he was with the national team and that a part of the vision of the UAAP is (sec. 2) “to develop athletes of national and international caliber in support of the country’s sports development program.” Bro. Bernie concurred with the statement. Fr. Emerito de Sagon of UST said that particular provision pertains to other leagues such as the PBL and that national team duty is an exemption. However in the June board meeting, the FEU representative, Anton Montinola brought up the matter once more. Personally, I have no idea why this has cropped up again. I'm surprised that FEU is making all this noise once more. They did it with Jobe Nkemakolam before in another case of double jeopardy. They seem to question a lot of things and get away with even more. For instance, they did away with the recommendation of the football committee to suspend Master Kim after he attacked a referee two years ago. Even the finals of the football competition (and the laws of football) have been superseded by a best-of-three finals. And there's the inane Soc Rivera Rule (roll eyes all together now). In case you want to know, I asked JR Bulangis if he paid any dues or whatever when he transferred out of FEU to JRU. None whatsoever. I can ask quite a few more ex-Tams and will get the same answer. Can't get wins on the playing field? Your boardroom is your last resort. If this goes to a vote then the whole thing is one big joke. While watching the recently concluded FIBA Asia Champions Cup tournament held in Manila, I joked with a couple of media colleagues how Qatar’s Targuy Ngombo was like a poor man’s Dwyane Wade. He’s plenty explosive and has got a great jumper. Imagine my surprise when I was reading about the Draft Day trades that Portland acquired the rights to Ngombo who averaged 16.3 ppg during the FIBA tournament. Ngombo led Qatar to a third place finish. According to the nba.com article, as part of the deal with Dallas, Portland also acquired the draft rights for 6-foot-6 Ngombo, a Congolese forward who has played in Qatar since 2006. Ngombo (photo on right from FIBA Champions Cup website) was the 57th overall pick. While there were reports that the Blazers had struck a deal with Minnesota for Ngombo, Portland’s acting General Manager Chad Buchanan would not confirm it. "We're currently in discussions to trade his rights. I'll leave it at that," said Buchanan. I wish Targuy Ngombo all the luck and that he is able to get some playing time with the Blazers. Look at Rudy Fernandez, unhappy with the lack of minutes. Maybe with Dallas he’ll play better. And quite honestly, I thought the shallow draft made the trade talk a little more interesting. No blockbuster stuff yet. The possible lockout has put a damper on the proceedings. Now that brings to mind the late Drazen Petrovic who also left Portland because of the lack of playing time. And Petro blossomed into an All-Star with New Jersey. Will lightning strike twice for Rudy Fernandez? We’re going to find out. AFTER WRITING THIS, COACH NASH RACELA SENT ME THIS. OY VEY! Nike Philippines announced that Kobe Bryant will return to Manila for a third time on July 13, 2011 to kick off a five-city tour. Manila will be his first stop before moving on to Seoul and various cities in China. Kobe’s one-day visit will begin with a short show at Nike Park, The Fort at 3:00 PM. The main event will be at Araneta Coliseum at 5:00 PM featuring players from Nike-sponsored FEU Tamaraws, DLSU Green Archers, ADMU Blue Eagles and Smart Gilas Pilipinas. Kobe will teach these young athletes on how to better improve their skills for the coming basketball season. 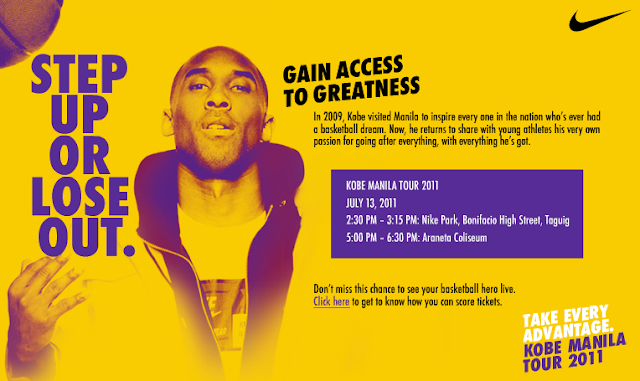 Take every advantage and see Kobe live on July 13, 2011. Tickets will be distributed at Nike Park The Fort and Titan The Fort for one day only at 12NN on July 2, 2011. Tickets are free of charge and will be distributed on a first-come, first-served basis. Only two tickets will be given per person. Additionally, people can tune into Magic 89.9 and Wave 89.1 to win tickets to the show. Fans can also like Facebook.com/Nikebasketball.phils where 50 lucky community members can get a chance to win 2 free tickets each to see the Black Mamba.